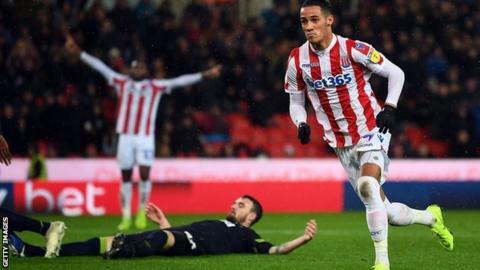 Gary Rowett's Stoke City held off his old side Derby County with 10 men for nearly an hour to earn an impressive victory thanks to Tom Ince's winner against his former club. Sam Clucas' first Potters goal put Stoke in front before Oghenekaro Etebo was shown a straight red card for his dangerous boot in to Richard Keogh's shin. In the aftermath of Etebo's dismissal, Bradley Johnson grabbed Joe Allen's shirt with his teeth in a tussle after appearing to attempt to bite his shoulder, an incident which saw both receive yellow cards. Derby were level after half-time when Harry Wilson's free-kick found the top corner before Ince slotted home from Clucas' square ball to send Stoke up to 12th in the table, five points below the Rams. The result stretched Stoke's unbeaten streak to six matches, while ending their run of three consecutive draws. The two sides were meeting in a league fixture for the first time since 2007 and it was Derby who enjoyed the far greater share of possession. But Ince's well-taken fourth goal since joining the hosts in the summer inflicted Frank Lampard's side's third defeat in five games. Stoke boss Rowett was facing Derby for the first time since he left them at the end of last term. "By far it was the gutsiest performance of the season and we all knew we needed it. "We didn't start great again but then we really turned on the pace and we looked really dangerous. "I've spoken to the referee and said I don't want to take the aftermath of the sending off any further, it's absolutely no problem." "We made some little tweaks at half time to get more attacking players on the ball more, we did start doing that, but then when the goal went in we didn't carry on in the way we should have. "When they got the second goal, and it's not that it was easy for them, but it is easier to feel like you can protect something and sit deep and defend as they did. "That's when the onus is on us to break it down, and we didn't do that." Match ends, Stoke City 2, Derby County 1. Second Half ends, Stoke City 2, Derby County 1. Ryan Woods (Stoke City) wins a free kick in the attacking half. Attempt saved. Mason Mount (Derby County) right footed shot from outside the box is saved in the bottom left corner. Substitution, Stoke City. Thomas Edwards replaces Tom Ince. Attempt blocked. Richard Keogh (Derby County) header from the left side of the six yard box is blocked. Assisted by Tom Lawrence with a cross. Attempt missed. Ryan Shawcross (Stoke City) header from the centre of the box is high and wide to the left. Assisted by James McClean with a cross following a corner. Corner, Stoke City. Conceded by Richard Keogh. Benik Afobe (Stoke City) wins a free kick in the defensive half. Attempt blocked. Jack Marriott (Derby County) left footed shot from the right side of the box is blocked. Assisted by Scott Malone with a cross. Corner, Derby County. Conceded by Jack Butland. Attempt saved. Tom Lawrence (Derby County) right footed shot from outside the box is saved in the top centre of the goal. Assisted by Jayden Bogle. Corner, Derby County. Conceded by Ryan Woods. Attempt blocked. Harry Wilson (Derby County) left footed shot from outside the box is blocked. Assisted by Tom Lawrence. Attempt saved. Tom Lawrence (Derby County) right footed shot from outside the box is saved in the centre of the goal. Assisted by Scott Malone. Richard Keogh (Derby County) wins a free kick on the right wing. Foul by Benik Afobe (Stoke City). Substitution, Stoke City. Benik Afobe replaces Saido Berahino. Ryan Woods (Stoke City) is shown the yellow card for a bad foul. Tom Lawrence (Derby County) wins a free kick in the defensive half. Attempt saved. Tom Huddlestone (Derby County) right footed shot from outside the box is saved in the centre of the goal. Assisted by Mason Mount. Offside, Stoke City. Jack Butland tries a through ball, but James McClean is caught offside. Jack Marriott (Derby County) is shown the yellow card for a bad foul. Foul by Jack Marriott (Derby County). James McClean (Stoke City) wins a free kick on the left wing. Substitution, Stoke City. James McClean replaces Sam Clucas. Substitution, Derby County. Martyn Waghorn replaces Craig Bryson. Richard Keogh (Derby County) wins a free kick in the defensive half. Foul by Saido Berahino (Stoke City). Attempt saved. Fikayo Tomori (Derby County) left footed shot from the centre of the box is saved in the top left corner. Assisted by Mason Mount with a cross. Corner, Derby County. Conceded by Joe Allen. Corner, Derby County. Conceded by Cuco Martina. Attempt blocked. Mason Mount (Derby County) right footed shot from the left side of the box is blocked. Assisted by Scott Malone with a cross. Goal! Stoke City 2, Derby County 1. Tom Ince (Stoke City) left footed shot from the centre of the box to the bottom left corner. Assisted by Sam Clucas with a cross.